Discover the lodges and camps for our Zimbabwe wildlife safari. Nestled under the acacia trees on the southern edge of Ngamo Plain. Camelthorn Lodge is pure comfort and style. Eight luxury villas contain en-suite facilities with separate bath and shower, main deck and upstairs open-air day bed and hammock. Safari guides provide game drives, walks and visits to the local village. There is a unique underground blind that affords photographing the wildlife from ground level. Nehimba Lodge provides luxury living with the elephants. Seven guest accommodations are uniquely designed thatched roof tents built upon teak platforms, each with their own private balconies, outdoor showers and full en-suite baths. Hot and cold running water and generator driven electricity ensure a comfortable stay. Game drives and walks are tailor made to guest preferences. Eight luxury tents, each with its own private plunge pool, en-suite baths and outdoor shower are dotted along the banks of the Zambezi. 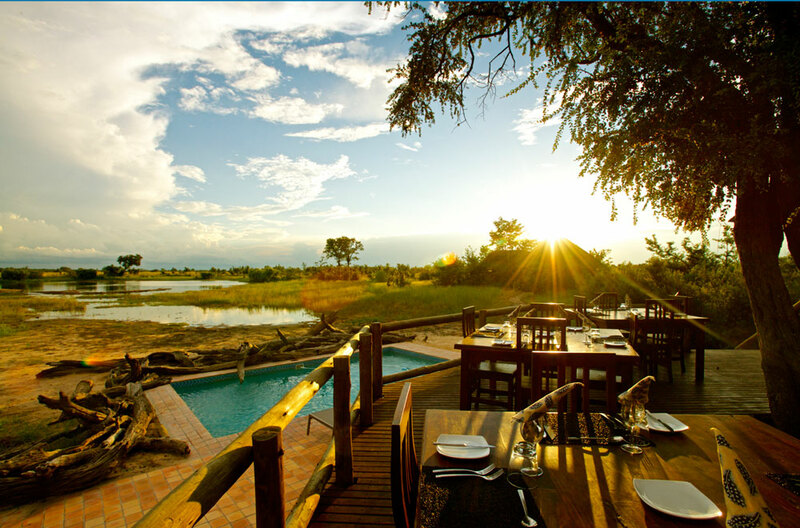 The main lodge and dining room provide panoramic views of the Zambezi River. Guests are treated to game drives, game walks, fishing, canoeing and island picnics.